Volcan, Panama, why did you choose to live here? This is a question I often ask ex-pats. Colleagues are not immune, so I asked David Dell, an experienced traveller, why he chose this small community over the thousands of other communities he has seen all over the world. The following article is his answer. January 2010. After living here for five years, I re-read my previous article to see if there had been any great changes here in Volcan. It is still affordable, coffee in the morning is still 40cents and yes you can still get a lunch for $2.00. We have another supermarket, a branch of HSBC bank and you can still by a home here for $40,000. More expats are moving here each month, many come with their families. The weather seems to have improved considerably - last year we had just one month of miserable rainy weather. If this year (2010) continues this way then yes, this is still a great place to move to and retire. It is not paradise - we have some problems with break-ins, but little by little we are coming as close to the ideal Shangri-La valley existence as is possible. On April 27, 2005, my wife and I and our 12-year-old Schnauzer moved to the small Panamanian mountain community of Volcan. We bought a small house there and in September, 2005, we were finished remodeling. 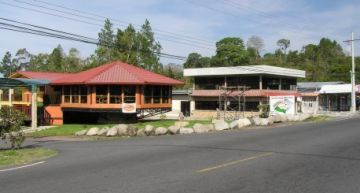 Moving to the highlands of Chiriqui Province was not a whim. As former writers and video producers for a leading retirement newsletter, my wife and I have seen more than most when it comes to retirement locations. So why did we choose Panama and specifically Volcan? In 2005, after living four years in the 90-degree plus temperatures of Nicaragua, we needed a cool change. Having previously checked out Belize, Ecuador, Mexico, France, Ireland, Panama and Britain, we had a clear idea of where we would move next. 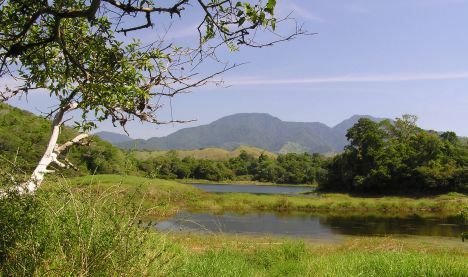 A friend had told us about a small town in Panama, close to Boquete, with the same eternal spring climate, better infrastructure and where property could be bought for a fraction of the prices being asked in the now highly inflated Boquete. To reach Volcan, you have to fly from Panama City to the city of David. This is a one-hour flight and two airlines service this route with five flights a day. That’s one of the things you will find in Panama – it’s officially a third world country, but from the high rises of Panama City to the quality of the country's infrastructure, you would almost swear it’s first world. From David, we rented a car and drove 15 minutes along the modern, four-lane Pan-American Highway to Concepcion. From there we turned north and drove the final 30 minutes to Volcan. The drive up the mountain to Volcan is a tonic for the soul in itself. My wife and I were constantly looking to the left and right as breathtaking vistas unfolded. To our right was the constant feature of the nearly 12,000-foot Baru Volcano, the highest in Panama and long extinct. 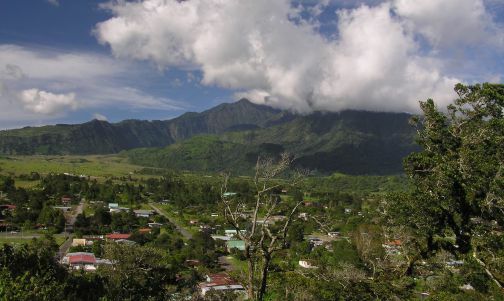 When you reach Volcan, the road passes over a ridge and you descend into the town itself. 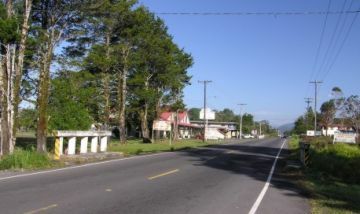 The road is well paved and as you pass along the main street, you see several supermarkets and gas stations. The community is not as crowded as Boquete. There is visibly a lot more breathing space in this location. In front, you see one of the neighboring mountains and to the right is the magnificent Baru Volcano. In the setting sun, the evening clouds are tinged with reds and pinks, contrasting the deep emerald greens on the pine covered slopes of the surrounding hills. 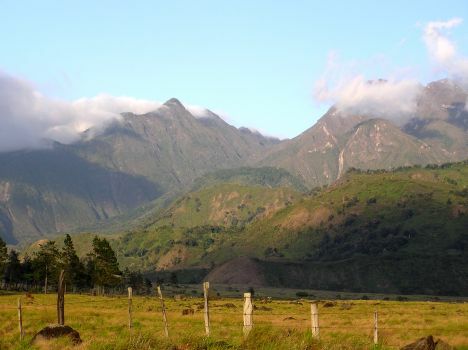 Anybody with a love for life and beauty would have to conclude that Volcan is truly one of the world’s special places. Volcan will surprise you. The town is small with a population of just 10,200 (2000 census), but the facilities are amazing. On the main street alone, there are four large supermarkets, four gas stations, five hardware stores, three bakeries and more than twenty places to eat. The people are even more amazing. From my amateur psychologist viewpoint, I believe the wonderfully even-temperatured environment is responsible for the wonderfully even-tempered people. More fish than you can shake a rod at. If you love fishing then this is the place for you. Local streams teem with trout and for those lazy six-pack relaxing weekends; Volcan has two small lakes, fives minutes from town. One lake has a legendary "monster" fish, locals talk of it but no one has so far caught it. The official language is, of course, Spanish, but I was amazed at how many people have a working knowledge of English and are eager to assist you when your obvious lack of the local tongue gets you in difficulties. Helpful bank manager The bank manager, for example, spoke perfect English, and within 30 minutes had set up an account for us and helped us access cash from the ATM machine. A typical morning in Volcan starts with a clear blue sky, interspersed with the odd puffy white cloud. The air is as fresh and clear as an English summer’s day. From my upstairs bedroom window, I can almost reach out and pluck an orange from one of many fruit trees that fill my property. Birds twitter busily at the start of their day, and across the road cows impatiently wait to be unburdened of their milk. As I drive down the almost deserted streets, the first few rays of sun are warming them. The temperature is a fresh 64 degrees Fahrenheit, just enough to require a light sweater. By 10:30am, the sun has warmed sufficiently that I can spend most of the day walking around in a t-shirt and shorts. My favorite small restaurant serves coffee and a decent breakfast for less than $2. Lunch, consisting of chicken, salad, rice and beans will set you back a mere $1.50. In nearby David, I can buy a liter of decent red wine for $1.85. Two days ago, I stood on top of a hill at the back of my house. Before me was a wide green valley and between the clefts of nearby hills I could see all the way down to the Pacific Ocean. With a deep blue sky peering from behind white puffy clouds and a fresh invigorating breeze blowing though my hair I thought: "Can it get any better than this?" Come and experience this wonderland of eternal spring for yourself. Be careful though – you may never want to leave.